Things are looking up for the Detroit Red Wings who managed last night to pick up their third straight victory by edging the New Jersey Devils 4-3. Justin Abdelkader and Trevor Daley each scored shorthanded goals in the third period to give the Wings the win, which is surely bring the spirits up in Hockey Town and in the dressing room as the first month of the regular season calendar has come to an end. However, this news report from former Red Wings captain Henrik Zetterberg might be a sad reminder for the fan base of what the start of the season could have been without the retirement of the legend. Zetterberg revealed the real reason why he had to retire on Thursday. According to several tests he underwent, “a degenerating disc eventually caused a nerve problem and a malfunction of a muscle that controls the movement of the ankle” led to his retirement. 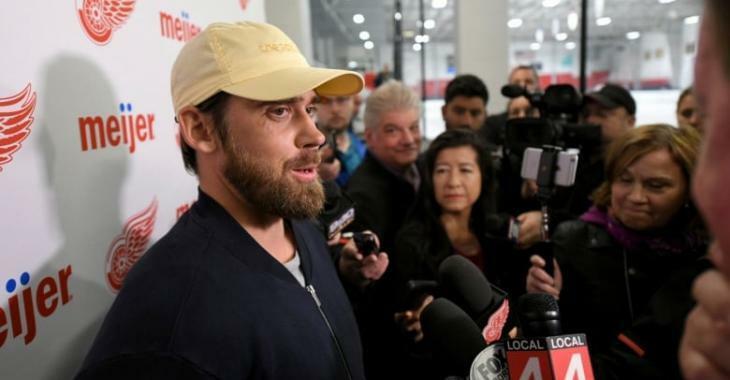 “For me, I think even with the way that everything went down with the (retirement) announcement in Traverse City and all that, deep inside I knew, pretty much, last year,” Zetterberg said to the Detroit News as he was present last night for the team's game. After keeping quiet about his condition, the veteran player thought it was time to be honest and reveal the real reason why he had to hand up the skates before training camp in September. As the Detroit News explains, "back spasms he began experiencing in 2006, a few seasons into his NHL career, resulted from his muscles accommodating the weakening disc." Zetterberg was affected by the condition throughout his entire career, needed surgery after the 2014 Winter Games in Sotchi, Russia, and experienced lost of sensation and couldn't control his ankle during the postseason of 2014. He said he played two 2014 playoff games against the Bruins with the ankle taped to prevent almost any movement. The Wings lost the series, 4-1. “I played,” he said. “But I could not skate. Despite all of the issues caused by his back condition, Zetterberg missed only five games the next season and played in every game the next three seasons, the last of his career. Zetterberg wants to stay in Michigan. He might get to see the Red Wings improve and become better and better as the 2018-19 season continues.